Heartbreak and transformation in the beauty of a Ukrainian village. For seven-year old Angela, happiness is exploring the lush countryside around her home in western Ukraine. Her wild imagination takes her into birds and flowers, and into the waters of the river. All that changes when, one morning, she sees her mother crying. As she tries to find out why, she is drawn on an extraordinary journey into the secrets of her family, and her mother’s fateful choices. Can Angela lead her mother back to happiness before her innocence is destroyed by the shadows of a dark past? Beautiful, poetic and richly sensory, this is a tale that will haunt and lift its readers. What is the plot and setting for The Woman Behind the Waterfall? 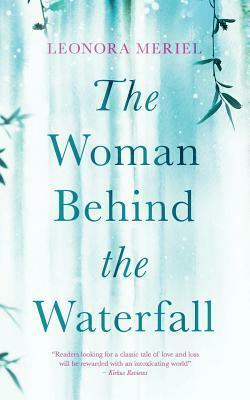 The Woman Behind the Waterfall is a tale of three generations of women in a Ukrainian village. They are all trying to find happiness in their own ways and they all face their own fears and barriers to happiness. There is a lot of transformation and magic in the book, but ultimately it is about what happiness means, and the role of family. Was there a kernel idea for this book or a series of them that led you to the premise? There were two core ideas behind The Woman Behind the Waterfall. The first was to describe the culture and land and language of Ukraine – a country where I had lived for ten years, and which was known to very few people. The second was being at a crossroads in my life: when I started the novel I had just turned 30 years old, and I was examining what had happened in my life up to this point, the choices I had made, how they were influenced by my mother, and how I was in turn influencing my own daughter. Thus, The Woman Behind the Waterfall is a novel about 3 generations of women and the difficult choices they make, set in a Ukrainian village. What do you like about writing magical realism? I love magical realism because it describes most accurately how I see the world. I am a firm believer that there is far, far more to the Earth and the universe than we, as humans, can perceive, and I am happiest when I am in a state of awareness that everything is possible, and that the physical elements we see around us are just a basic starting point. Thus, my character of Angela merges her spirit into birds and storms – she sees no division between herself and what is around her. The “accepted reality” of adult life has not yet clouded her understanding of the possible. Did you choose to write this book as magic realism or was the story best suited to the sub-genre? I had no preconceptions when I started the novel, except that it would be set in Ukraine, and would be about the choices and mistakes that we make in our lives. The magic came into the novel with the character of Angela, and then when her dead grandmother appeared, and then a guiding spirit. By the time it was complete, I understood that it was clearly magical realism, but this was only because the novel had become what it truly wanted to be. With which character in the book do you most strongly identify? The character of Angela is the one I most strongly identify with, as she was based on my own daughter. In the book, she is seven years old and she is at the turning point between the world of pure imagination that children inhabit and the adult world of accepted reality. For now, she can enter the spirits of birds and plants and wind and she experiences these as a part of herself, but she knows that she will not be able to do this forever. I based her character on observations of my own daughter growing up and the world of pure possibility that children live in. Until you tell children a fact, then they don’t assume that anything is fixed or limited. It’s the most beautiful thing and adults would do well to try to learn some of this flexibility again. Is there a character in the book that repulses you and was it hard to write about this same character? I haven’t yet written a character that repulses me, and I doubt I would be able to. As a writer, you have to do your best to be inside a character’s head when you write their story and their motivations, and once you understand why a person is acting, it is difficult to hate them. As a wise friend of mine says – all anyone wants is to be loved – and I believe this is true, even if they end up with awful, twisted ways of expressing that. How much did you research the setting of the book and did you learn something new from the research that enhanced the book in some way? I knew Ukraine extremely well when I wrote the first drafts of the book, as I had lived there for ten years. However, prior to the final draft, I went on a research trip to some villages to check the details and the language was all correct. While there, I learned how to make home-brewed vodka – samohon – and drank a fair bit of it. These details definitely made it back into the book! What other writing projects are you planning? I’m currently working on three different books. I spent between four and five years each on my first two novels and I wanted to work on several projects now to get some diversity. In my first novels I wrote in the genres of Magical Realism and Science Fiction, so I’m now experimenting with some straight literary fiction. It’s challenging, as my imagination likes to roam, but I’m trying to keep it at least on the Earth this time! Leonora Meriel is the author of The Unity Game (published May 2017, Granite Cloud) called an “ambitious and thought-provoking novel” by Kirkus Reviews. Her debut novel The Woman Behind the Waterfall (October 2016) was hailed as “strange and beautiful” by writer Esther Freud, “a literary work of art” by Richmond Magazine and “an intoxicating world” by Kirkus Reviews. 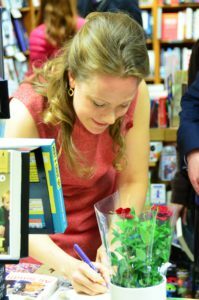 She is one of a select group of independent authors chosen by Waterstones – the leading bookshop chain in the UK – to be stocked nationwide. Leonora grew up in London but has lived in New York, Kyiv and Barcelona. She worked in business and then as an entrepreneur, before turning to writing full-time. You’re welcome. Glad the button came back in time. Me too regarding the button.